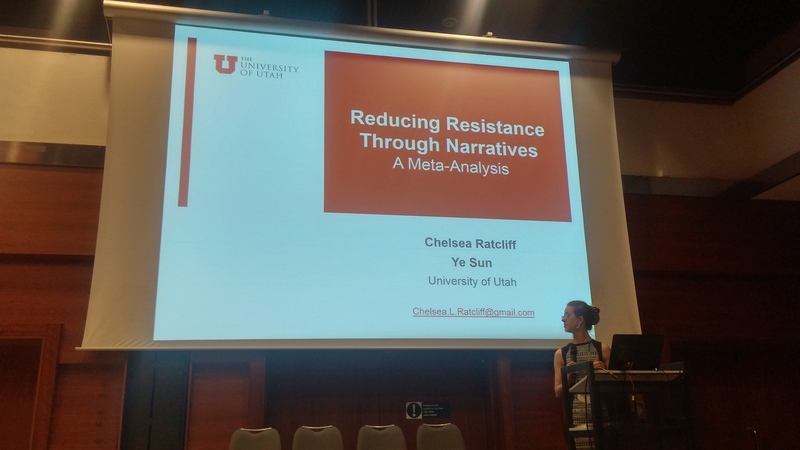 This past May at the International Communication Association‘s annual meeting, I got to present the latest version of a meta-analysis of studies examining the potential for narrative messages to lower resistance to persuasion. 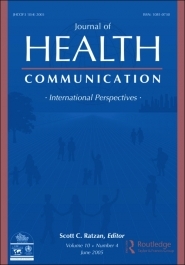 My coauthor Dr. Ye Sun and I received two awards for the paper: top student-led paper in health communication, and one of the top four papers in health communication. Curious about the findings of our analysis? In short: narratives had a small but significant advantage over non-narratives when it came to reducing resistance to persuasion—which is either exciting or cause for caution, depending on how you look at it! We also found that the association between higher narrative engagement and lower resistance held up across studies. In other words, when people are more transported into a story or are identifying with the main characters, there’s a good chance they’ll be more persuadable. Across studies, there were several moderators of these effects, which we’ll reveal in the manuscript once it’s published. 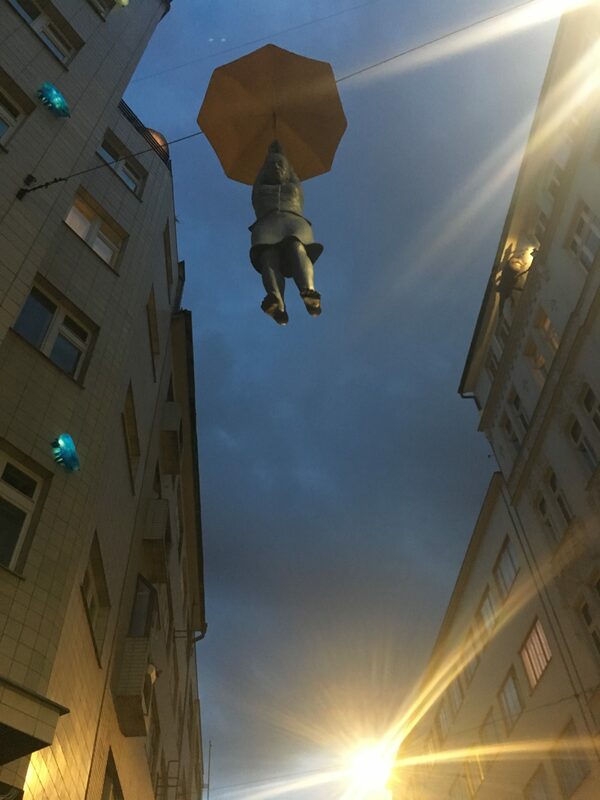 Winning awards in the Health Communication division was a great honor, and it was also a great excuse to visit Prague for the first time! This entry was posted in Uncategorized and tagged health communication, ICA, meta-analysis, narrrative persuasion, reactance on June 12, 2018 by Chelsea. Precision medicine is the notion of a precise approach to healthcare—one that takes into account individual genetics, environments, and behaviors. As we enter this era of highly personalized care, there will likely be opportunities to take our health to new heights. But there may also be unforeseen consequences. To date, little is known about how healthcare consumers will respond to highly personalized guidance and treatment. The assumption is that responses will generally be favorable. Yet in the media and in online public discussions about precision medicine, concerns have been raised about invasions of privacy and autonomy. What challenges could arise as precision medicine is implemented in research trials and clinical settings? And can we address them, or prevent them, through better communication? These questions are explored in a recent paper published in the Journal of Health Communication. The authors—Communication PhD student Chelsea Ratcliff and professors Kim Kaphingst and Jakob Jensen—highlight the potential for patient alienation in certain precision medicine contexts, especially among minority groups. They offer an agenda for research to guide communication with patients and the public, in order to foster understanding of precision medicine and informed participation in precision medicine initiatives. In engaging these important questions, scholars from across disciplines can help bring ethical concerns and patient perspectives to the planning and implementation of precision medicine, ensuring medical and technological advances that are fair and beneficial for all. The article can be found here: Ratcliff et al 2018. Chelsea L. Ratcliff is a doctoral student in the Department of Communication. Kimberly A. Kaphingst is a professor in the Department of Communication and an investigator in the Cancer Control & Population Sciences Program at the Huntsman Cancer Institute. Jakob D. Jensen is a professor in the Department of Communication and a faculty affiliate of the Cancer Control & Population Sciences Core at the Huntsman Cancer Institute. This entry was posted in Uncategorized and tagged All of Us research program, health communication, precision medicine, precision medicine communication, Precision Medicine Initiative on June 7, 2018 by Chelsea.